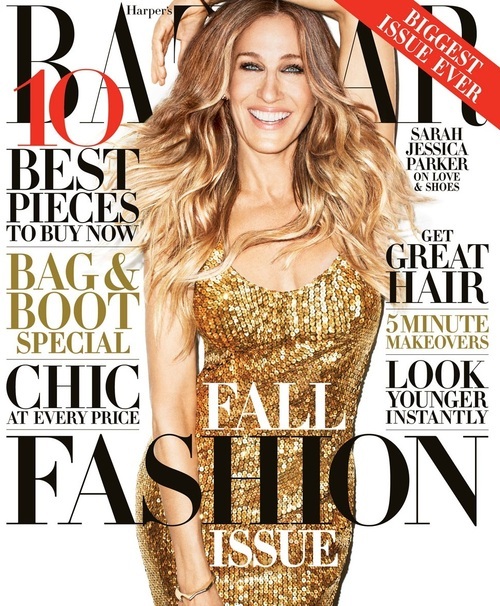 But I could not, COULD NOT, step away from the magnitude of Harper’s Bazaar Fall Fashion September issue starring my BFF in my mind, Sarah Jessica Parker. The clothes, Jesus, the clothes!!! The clothes, the clothes, the clothes!!! Phew. Okay I’m done. Shot by Terry Richardson, SJP looks beautiful, fun and free. J’adore. She thinks for a moment. “Matthew and I come from a different time and place. When we were young people, all we ever wanted was to be good working actors. We didn’t think of fame or money because, honestly, money was never part of the dream. It was to work in theater, to be around those people whose work I was in total awe of. I never saw the trappings; nobody talked about being a celebrity. So when our marriage came up in conversation, it wouldn’t occur to us that we were obligated to respond to allegations or gossip. You have to be a bit circumspect, but you also have to take up a position, and you have to stick to it. “She has a fan base in the fashion world that’s extraordinary, and it’s truly because she’s such a nice person,” says George Malkemus, president of Manolo Blahnik. Recently he teamed up with Parker to create an SJP line of shoes in the $250 to $450 range, to be sold at Nordstrom starting in February. “Were it anyone but Sarah Jessica, I wouldn’t have done it,” Malkemus says. Parker was awaiting the first samples from Italy when we spoke, but expect feminine shapes, plenty of low heels, and unusual color combinations like navy and mocha. “The shoe business is so exciting because we don’t have to think of black and brown as the only neutrals anymore,” she says. “It’s about a woman, a beloved talk-show host out of Minneapolis, whose husband is a cook. He sort of put his career on hold while she had this big success, and ultimately they move to New York to give his career a chance. But they’re floundering. He’s a hothead and he can’t really keep a job. Deeply lovable.” In the emotional turmoil her character winds up having an affair.